Well the honky-tonks in Texas were my natural second home, where you tip your hats to the ladies and the rose of San Antone. Asleep at the Wheel has seen miles and miles of Texas. They got their kicks on Route 66. And, in 2010, the band clicked another milestone on the odometer – their 40th anniversary. Now in their 41st year, the band continues to introduce the western swing genre to a new generation on tour and takes audiences on the ride of a lifetime with their play, “A Ride with Bob.” “It’s been an amazing ride. From Paw Paw to San Francisco to Austin, we’ve seen it all,” says Wheel front man Ray Benson. “But, rest assured, there are still so many exciting projects in the works. The Wheel keeps rolling!” It all started when Ray Benson, Floyd Domino, and Lucky Oceans, along with a Vermont farm boy named Leroy Preston; Virginian Chris O’Connell; and Gene Dobkin, a bass player and fellow classmate of Benson’s from Antioch College in Yellow Springs, Ohio, joined forces. They began with a simple goal: to play and help revive American roots music. Asleep at the Wheel landed a gig opening for Alice Cooper and Hot Tuna in Washington, DC in 1970. At the height of Vietnam, many Americans were using their choice of music to express their stance on the conflict in southeast Asia. “We wanted to break that mold,” said Benson. “We were concerned more with this amazing roots music, which we felt was being lost amid the politics. We were too country for the rock folks and we were too long-haired for the country folks. But everybody got over it once the music started playing.” A year later, they were coaxed into moving to California by Commander Cody, leader of Commander Cody & His Lost Planet Airmen. But, the band’s big break came when Van Morrison mentioned them in an interview with Rolling Stone. The record offers started coming in and The Wheel got rolling. The musicianship of Asleep at the Wheel has become the stuff of legends. 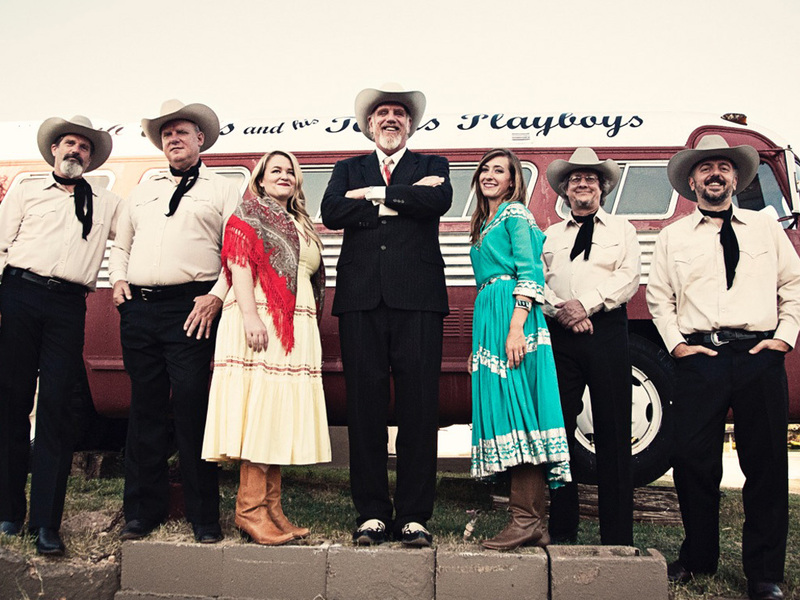 Reuter’s pegged The Wheel as “one of the best live acts in the business.” Taking a page from Bob Wills’ book, the band has constantly toured at a national level throughout its history; with anywhere from 7-15 of the finest players Ray Benson could talk into jumping in the bus to play a string of dates. The alumni roster is well over 80+ members, and includes an impressive list of musicians who have gone on to perform with artists such as Bob Dylan, Van Morrison, Lyle Lovett, Ryan Adams, and many more. A quick scan of awards, such as “Touring Band of the Year” (CMAs, 1976) and “Lifetime Achievement in Performance” (Americana Music Awards 2009), not to mention near dominance of the GRAMMY “Country Instrumental” category over the years, reflects the reputation of the band’s musicianship. Ray Benson fell in love with western swing because of its unique combination of elements of American blues, swing and traditional fiddling but also for its demanding musical chops. Western swing is what Benson calls “jazz with a cowboy hat,” is a thrill to hear live, and thanks in large part to the Wheel’s 40 years of promotion, is a living and creative genre of music today. Over their history, Asleep at The Wheel has garnered nine GRAMMY Awards and released more than 25 studio and live albums, and there is no sign of slowing down any time soon. Just last year they earned a Grammy nomination in the newly minted Best Americana Album category for their critically acclaimed Willie & The Wheel, on Bismeaux Records. Most recently, another collaborative project paired the band with the legendary lead from Bob Wills & The Texas Playboys, Leon Rausch. The distinguished velvety vocals that voiced the King of western swing partnered with “post-modern kings of Texas Swing” on It’s A Good Day, which USA Today called, “swing from the heavens.” It was Leon who first suggested to Ray in the 1970’s that The Wheel record Get Your Kicks (on Route 66). The Wheel has now recorded the hit 4 times in 4 different decades, with this latest version featuring Leon. The Broadway-scale musical that started as a commemoration of Bob Will’s 100th birthday in 2005 now marks its own milestone in 2010; 5 years. Ray Benson and Ann Rapp co-wrote the first-ever musical drama about Benson’s idol, entitled “A Ride with Bob: The Bob Wills Musical.” At the core of the story is the conversation Ray intended to have when he was invited to meet with Wills in 1974, fresh off the Wheel’s release of “Take Me Back to Tulsa.” Unfortunately, that meeting never happened as Mr. Wills took ill and never recovered. For the last five years, the play has presented an inspired look into the life, loves and music of the colorful Bob Wills in performances across Texas and from San Francisco to Washington DC. Immediately embraced by western swing fans, this unique presentation has achieved cult-status amongst fans who can’t get enough. This year “A Ride with Bob” continued its tour with performances in Abilene, Richardson and in Austin, September 17 and 18 at the Long Center. True to Asleep at the Wheel’s original vision, the play isn’t just appealing to core fans. A 2007 interview with The New York Times noted, “the play had another advantage. ‘We were reaching a completely new audience,’ Mr. Benson said — theatergoers who might never set foot in a beer joint, or even in a cowboy boot.” Any band that spends upwards of 250 days on the road each year is more than likely to have seen its fair share of dives, gin joints, biker bars, clubs, auditoriums, dance halls and the like. The Wheel is no exception. Another place Wheel fans have more recently discovered the music has been in symphony halls. Originally debuted in collaboration with the Austin Symphony, the Wheel has since gone on to present their pops program in select performances across the country, and even released a CD in 2006 of their performance with the Fort Worth Symphony Orchestra. Throughout their four decades the Wheel has driven the genre to the edge, explored new territories, picked up new passengers along the way and crisscrossed the country to the delight of fans and critics alike. And, even though they’re doing “forty,” there’s no chance of slowing down now.